Lately I have read some new SOA material like books and articles. 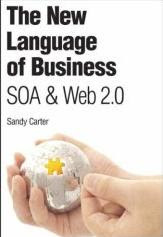 Yesterday I finished reading a book from Sandy Carter about new business language. The book reads like a journey from innovation to don'ts of SOA. It contains a lot of case studies from companies around the world applying SOA and plenty of information collated from years of research done at IBM labs. Chapter 3 on Component business model lays the foundation for how an enterprise can link the business and IT alignment for success. Chapter 9 on the top 10 don'ts reflects some true real world experience and the easy to make mistakes when one undertakes SOA projects. ESBs to Governance are explained in terms that both business and IT execs can understand quickly while carrying enough content for the technology people to refer back. This book introduces the reader to many important aspects of SOA and shows how to use them to achieve business flexibility: component business modeling, the SOA reference architecture, the SOA lifecycle, SOA governance, and the SOA entry points. This is great information for explaining to the business why SOA matters and what the business (not just IT) needs to do. SOA Architects and Models - David Linthicum. Good reading, I recommended taking a subscription (electronic). It will cost you only round 130 US dollars for two years. That is around 5 US dollars a month. You also get access to back issues, so it is worth it. Last but not least I have also started reading the book of Dirk Krafzig which I mentioned in a previous post and have some chapters ahead of me to read.